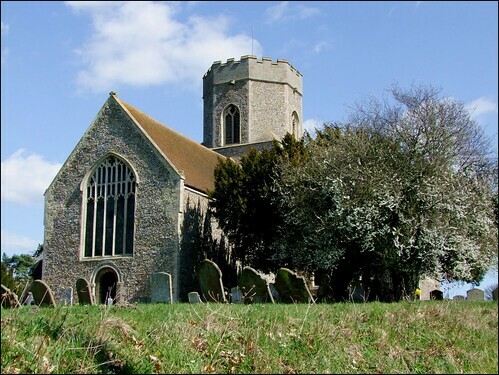 For Suffolk, this is an unusual church, and its village is unique in England. 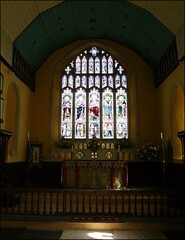 In fact, the church is unusual in several respects. Firstly, as you climb the beautiful rise of its graveyard, you will see immediately that it is cruciform, one of only a handful in the county. Others include Dallinghoo, Earl Stonham, Eyke and Oulton, although only the second of these survives in anything like its original form. Cruciform churches were frowned on by the reformers, not least because the use of transepts split the congregation up, and made it difficult to focus all the seating on the pulpit. Often, transepts were closed off, and even demolished. At Pakenham, too, much is rebuilt. Both the north and south transepts are 19th century, early work of Samuel Teulon, in 1849. He rebuilt the south transept, but the north transept had been missing for many years. But the west and south doors are fully Norman. The west door was once the main entrance to the church, and you can see clearly what access to places like Westhall must have once been like. The tower is rather glamorous. It is four-square, but evolves into an octagonal turret. Seen from the churchyard of Thurston, less than a mile away, one is hard-pressed to decide if it is a church or a castle. Since Teulon's time, entrance has been through his excellent north porch, but before going inside, take a tour of the building. Teulon's transepts are super, and I love his stairway turret to the tower. Walking around, the reset stone coffin lids in the south chancel wall are slightly surreal. This sense of things not being quite what they should be continues inside, because, in a misguided attempt to fill the crossing with light and increase the drama of the view to the east, Teulon destroyed the Norman western archway to the crossing, and replaced it with a mock Early English one; one is tempted to call it Earlie Englishe. This is not good, but fortunately the eastern arch into the chancel survives intact. A great delight stands to the west, though; this is the font, which is most unusual. Instead of angels, it features a bestiary accompanying the Evangelistic symbols. There is a fine unicorn, and a pelican-in-her-piety. Even more charming are the monks who sit around the shaft beneath. One is reading, another meditating, the other two holding objects. Mortlock thought they were a treasurer's satchel and a reliquary, but Jeremy Bangs tells me that it could be a book bag - you can find such books with bags attached in medieval paintings and sculptures. The whole thing is surmounted by one of those towering font covers, familar from Hadleigh and Bury St James, the fruit of tentative 1930s triumphalism. The other internal furnishings are of excellent quality; Anne Riches' supplement to Cautley records that they are based on the benches at Stanton Harcourt in Oxfordshire. A modern nave altar, decorated with ears and stooks of wheat, sits beneath the crossing in the approved Vatican II manner. The chancel beyond contains medieval return stalls, but is otherwise a superb example of late 19th/early 20th century richness, and the east window reflects the essential and enduring agricultural character of this parish. Don't leave without exploring the churchyard. Two notable graves are the one to three Victorian sisters south of the nave, and there is a very good modern memorial to Sarah Spicer in the form of sandstone pillar in the extreme north east corner. I said at the start that Pakenham village is unique in England. It is the only village still to have working both a windmill and a watermill. Of all the thousands that there once were in England, this is the only place where both continue to function.